The themes of my glass sculptures revolve around the psychological and physical relationships we have with animals and their larger connection to our environment. These colorful worlds allow me to explore concepts of perception, liminality, and memory. The result is a series of fantastic landscapes that bring a consciousness to their decorative status. My work examines the terrain of environmental responsibility and a sense of self. My sculptures tell a story about the fragility and conservation of these small worlds as well as describing their role in a grander scheme. References to cosmic phenomena are used to describe the work and remind the viewer of the vastness of time and the beauty of our place in it. These engaging and cheerful sculptures are a gentle mirror allowing us to examine our contradictory world. We live in a time when our smallest decisions can seemingly affect our environment in unpredictable ways. As a conscientious inhabitant I am constantly weighing my choices and attempting to choose the lesser evil. My miniature landscapes are often populated with animals and are evocative of childhood toys and stories. I orient many of my animals to be gazing into an unknown distance and I’m curious about what they see on the horizon. Much of my recent work centers on elephants due to their unique role as beloved childhood toy, popular decorative figure with a history in glassmaking, and a perilously threatened species. The play of color and pattern is the signature of my work. My glass sculptures are an integration of traditional Venetian glassblowing and cold working techniques using “cane”, a mosaic-like process that maximizes the effects of densely colored components to create patterns and bold color combinations. The liquidity and memory of hot glass as a sculptural material allows me to explore those properties and create work that harnesses the language of line, pattern, and color. My vision for the final work is as a strange and vibrant glass landscape that speaks to my interest in environmental issues in combination with a playful innocence. I have a unique voice in glass making and have shared my technical and creative processes through workshops, demonstrations, and artist talks. My glasswork speaks to audiences about the themes and concerns I want to represent. Where my work stands out for its technical acuity it also has an aesthetic that is whimsical, fun, and approachable. This pairing is attractive to audiences from varying perspectives and is a factor in my work's impact. My glass landscapes and animals are advocates for the precious worlds they represent. Claire graduated with her Bachelor of Fine Arts from Alfred University in 1996. In 2004 she was granted the EnergyXchange fellowship in Burnsville, North Carolina. 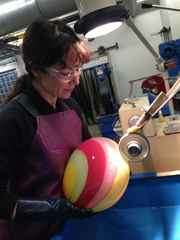 In 2008 Claire moved to Providence, RI to work with acclaimed glass artist Toots Zynsky. She has been an instructor at Penland School of Crafts, Pilchuck Glass School, the Pittsburgh Glass Center, The Studio at the Corning Museum of Glass, Haystack Mountain School of Crafts, and the Centro Fundacion del Vidrio in Spain. She has been a resident artist at the Pittsburgh Glass Center and received the Rosenberg Residency at Salem State University in MA. Recently she was an Artist in Residence at the Studio of the Corning Museum of Glass where she created a new body of work using specialty glass from Effetre, a glass company based in Murano, Italy. She continued this investigation at a residency at Salem Art Works in Salem, NY in September of 2018. Claire was selected to be a demonstrating artist at the Glass Art Society Conference in Venice, Italy in 2018 and was a visiting resident artist at the Museum of Glass, Tacoma, WA in the fall of 2018. Her work is on view at Duncan McClellan Gallery in St. Petersburg, FL at the exhibition “Vibrant Perspectives”.